The Doll’s Festival, also known as Girls’ Day is coming this Thursday. Many households which have small girls in the members decorate hina-ningyo dolls in their houses. 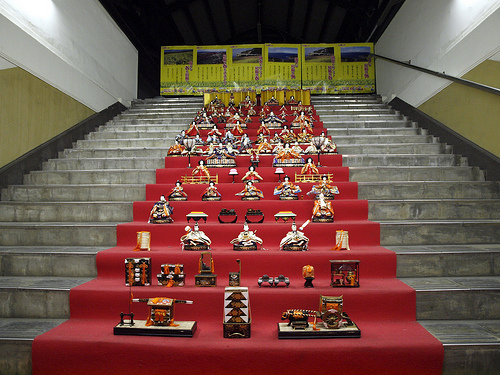 But it is quite rare that national railway staff decorate hina-ningyo on stairs of platforms. This hina-ningyo is in JR Ryogoku Station, which is right next to Ryogoku Kokugikan, also known as Sumo Hall. When you go into the west ticket gate, there are some notices announcing “Enjoy hina-ningyo. Ryogoku Station’s staff decorated it!! Please feel free to look at it,” and a long red carpet goes up to stairs, on which 16-step gorgeous hina-ningyo is put in order. Because Ryogoku Station has a couple of disused platforms, the staff used one of them to attract the passengers. The video below shows the detail of the hina-ningyo. Ryogoku Station has two ticket gates; east and west. Sumo Hall and the Edo Tokyo Museum are both on the west side, where you can see sumo wrestler’s statue and a large sumo painting.